Few enough of us hear those things, or see and feel them, but fewer still do something about it. George Handley is one of those precious few, and is regularly in the breech. Handley is a professor of Humanities at BYU in Provo, Utah. He is also an active environmentalist and an avid outdoorsman. 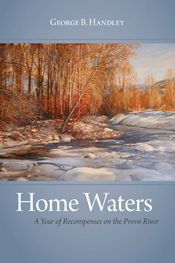 His recent (and still running) book, Home Waters: A Year of Recompenses on the Provo River, has made a substantial impression as both memoir and important work of environmental theology. George speaks and writes on the issues he raises in his book–and so much else–often and stirringly and in ways that provoke both humility of spirit and a desire to do a little something to help. He has graciously sent along the following excerpt. Winter has been defeated, no question. It is a glorious spring day today, and I can’t resist the temptation to get in a run early this morning before the kids’ Saturday soccer games. The impression of an evergreen valley, coated in velvet grass, only lasts a month or two before the piercing sun at these altitudes brings the green into submission. I don’t mind the brown like I used to, which is why I feel all the more guilty for my pleasure, which in Utah feels like the sinful pleasures of the carnal mind. So be it. Today I will be a hedonist and I will stare unapologetically at the viridian velvet of the mountain contours. The twentieth century has gone down in history for a number of ignominious as well as heroic events, but certainly one of its more troubling legacies is its treatment of rivers. As agriculture gave way to industry and massive development of cities, water was victim to an increasingly private and individualistic conceptualization of property. Consequently, rivers suffered greater transformation than in the previous ten thousand years. They were straightened, diked, and dammed, and where I live water was transported from less populous areas and fed into the Provo, all to provide more space for homes, more safety from floods to homeowners, and reservoirs to ensure the perpetuity of modernization. And as Donald Worster reminds us, the Mormons played no small role in this harnessing of water’s wild and unpredictable ways, seeing dams and dikes as the way of the Lord. 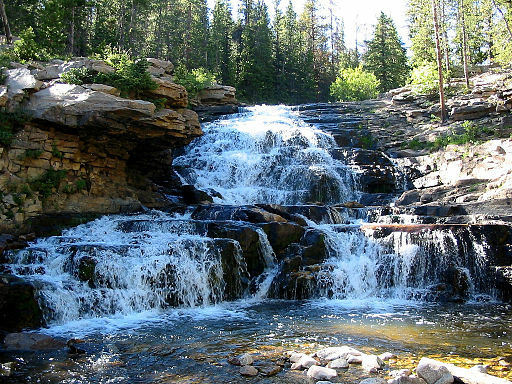 Several small hydroelectric dams were built on the Provo early in the century, and then two major dams were built, one in the 1940s and the other in the 1990s. muster a pretense of escape. Perhaps it remembered the ants. Steve Peck is an ecologist at Brigham Young University. Creative works include a novel: The Gift of the King’s Jeweler (2003 Covenant Communications); a self-published novella A Short Stay in Hell (reviewed here and here), a short science fiction story: The Flaw in the Lord Harrington Scenario, published in HMS Beagle (online journal by Elsevier); poetry in Dialogue, Bellowing Ark, BYU Studies, Irreantum, Red Rock Review, Glyphs III, Tales of the Talisman (in press), and a chapbook of poetry published by the American Tolkien Society called Flyfishing in Middle Earth. A version of “The Ant Lion” appeared in Glyphs III (2007), 141-143. He blogs at bycommonconsent.com and has a faith/science blog called The Mormon Organon. whoop in the morning like freckled boys on stilts. One body: some days, I swear, one is almost enough. squeeze into that broken parable we call first light. wondering which of my faces morning will erase first. Lance Larsen’s most recent poetry collection is Backyard Alchemy (Tampa 2009). His work appears in such venues as New York Review of Books, Orion, Slate, Poetry Daily, Raritan, LIT, Southern Review, and Best American Poetry 2009. He has received a Pushcart Prize and a fellowship from the National Endowment for the Arts. He teaches at Brigham Young University, where he serves as associate chair. In spring 2010, he will direct a theater study abroad program in London. “Rough Translation” was previously published in Field. take me there once more. “Hymn to Autumn” has been nominated for a Pushcart Prize. It was published in Joyful!, an online Christian magazine, in October.